* This is my column in BusinessWorld last February 19, 2019. On the Philippines’ GDP growth rates, the good news is that from 2010 to 2018, the Philippines has been growing above 6% yearly except in 2011. High growth was experienced in 2010 with 7.6% (recovery from 2008-2009 global financial turmoil) and 2013 (election year) with 7.1%. The bad news is that these growth rates are not enough. The Philippines, with 106 million people, has a GDP size in 2017 of only $314 billion while neighbors with their smaller populations had similar or larger GDP sizes: Malaysia (32M) has $312B, Singapore (5.8M) has $324B, Thailand (69M) has $490B. We need to grow 7-10% per year for many years before we can even catch up with Thailand or Malaysia (Source: IMF, World Economic Outlook [WEO] October 2018). 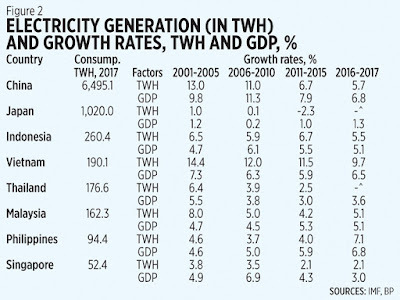 Among the important factors to have high and sustained growth is to have high and rising supply of cheaper and stable electricity. There are numbers that show a correlation between GDP growth and electricity consumption growth especially for developing countries like the Philippines (see Figure 1). Among the ASEAN 6, a similar pattern can be observed, also with China and Japan. 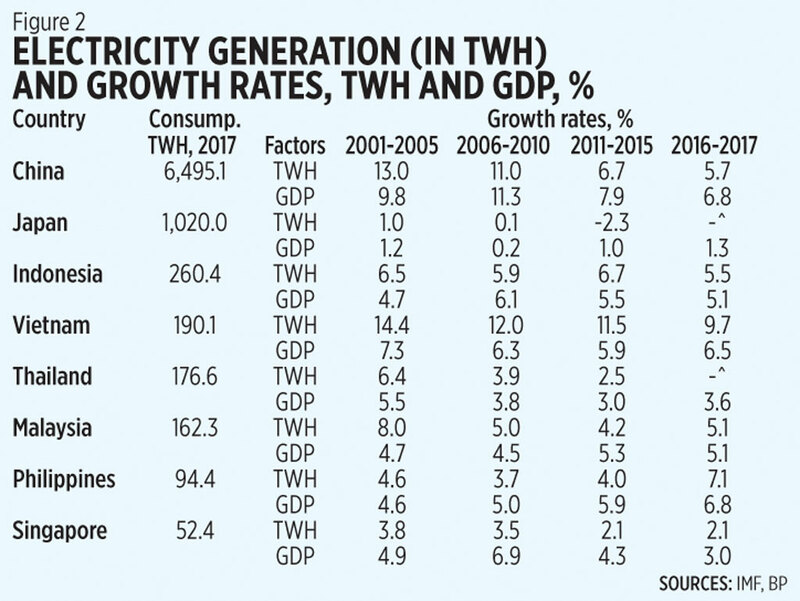 The Philippines’ low GDP size is reflected in its low electricity consumption in tera-watt hours (TWH) (see figure 2). There are many factors why our electricity supply and consumption is low compared to our neighbors, like the thick, expansive bureaucracies and permits required before one can explore and develop new power plants. We focus on the role and “mis-role” of electric cooperatives (ECs). 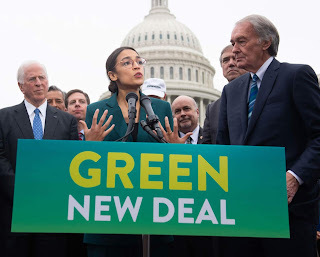 Since they are geographical monopolies granted with congressional franchise to distribute electricity, they can help expand or restrict power demand. If an EC for instance is mismanaged and does not pay the power generation company (genco), even if the genco has big plans to expand power capacity, it cannot do so. So DoE will conduct a performance review of ECs, especially those that burden their communities with persistent and unresolved brownouts, because they have heavy debts and do not pay their power supply. Underperforming ones will be assisted while non-performing ones will be recommended for cancellation of their franchises. DOE has identified 17 ECs that are chronic failures to provide satisfactory services to their customers as stipulated in their congressional franchise. Seven are from Regions IV-B and V — ALECO (Albay), CASURECO III (Camarines Sur), FICELCO (Catanduanes), MASELCO (Masbate), OMECO (Occidental Mindoro), ORMECO (Oriental Mindoro), and PALECO (Palawan). Other problematic ECs are PELCO (Pampanga), BASELCO (Basilan), LASURECO (Lanao), SULECO (Sulu), ZAMCELCO (Zamboanga), and DANECO (Davao del Norte). Then certain islands have rising missionary subsidies — which are then passed on to all electricity consumers nationwide via high universal charges. In three previous articles in this column, “Unstable power supply due to problematic electric cooperatives” (February 08, 2017), “How the bureaucracy works against cheap and stable electricity (March 08, 2017), and “Corporatization of electric cooperatives can reduce system loss” (September 29, 2017), it is argued that ultimately all ECs should be corporatized and depoliticized, be registered as corporations with SEC, and not with NEA. Senators Jinggoy Estrada, Juan Ponce Enrile, and Ramon "Bong" Revilla Jr. are convicted plunderers in connection with the Napoles pork barrel scam, were put to jail in the previous administration. Enrile was freed "due to health reasons" while Estrada and Revilla were later freed under the present administration. See https://newsinfo.inquirer.net/1044283/3-ex-senators-in-pork-scam-running-again. Former President and now House Speaker Gloria Arroyo was also a convicted plunderer and was on hospital arrest but was later acquitted by the Supreme Court. See https://www.rappler.com/newsbreak/iq/140221-timeline-gloria-arroyo-plunder-acquittal. And former First Lady Imelda Marcos was also convicted of graft and corruption. See https://www.philstar.com/headlines/2018/11/10/1867352/imelda-marcos-found-guilty-graft-faces-arrest. The Ressa arrest is due to a cyber libel filed by businessman Keng. A case between two private individuals. 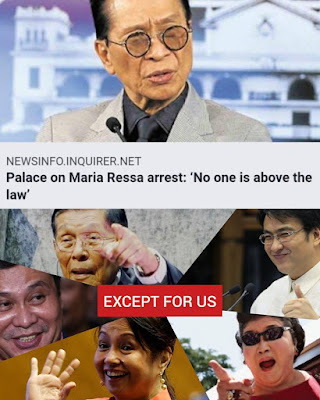 While the Duterte administration may be correct in saying that they just want to follow the rule of law in the Ressa arrest, they cannot say they also followed the rule of law for indirectly sponsoring the release of the convicted Senators. (4) Trump 2+ years 12.0 mbpd. Or an increase of 3.8 mbpd after 8 years of Obama, and increase of 3.2 mbpd after 2 years and 2 months. 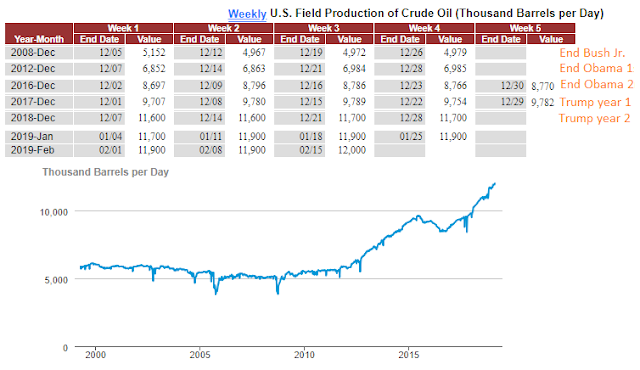 Saudi and Russia oil production about 11.5 mbpd each and they are cutting their output to force higher oil prices while US is raising output to lower oil prices. 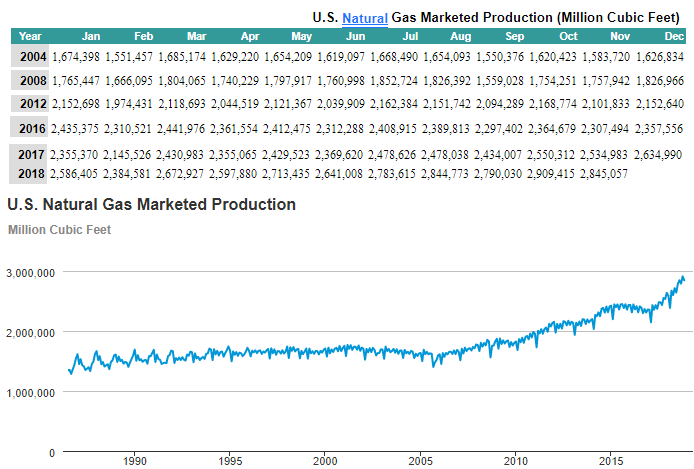 And US natural gas production. (5) Trump 1 year 11 months, 2.84 tcf. Or increase of 0.53 tcf after Obama 8 years, increase of 0.48 tcf after Trump 1 year and 11 months. Reduce energy prices by expanding production, continuously. Debureaucratize energy exploration, extraction and transportation. * This is my article in BusinessWorld last February 15, 2019. While I have been to many ASEAN countries, it was only recently that I have visited some South Asian countries like India (Mumbai only), Nepal, and Bhutan, all related to attending the Asia Liberty Forum (ALF) or the Economic Freedom Network (EFN) Asia conferences. The big cities in our ASEAN neighbors are modern and developed, starting from their big and modern international airports. Flying from Manila is also easy because of (a.) the short distance, maximum four hours direct flight; (b.) 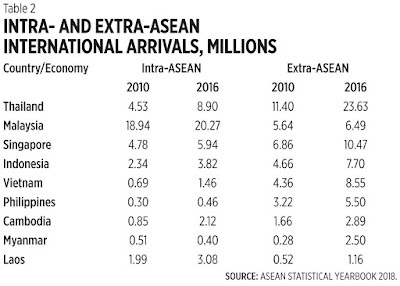 lower fares due to many competing airlines; and, (c.) visa-free entry for ASEAN visits of less than 30 days. The South Asians have a different environment. Bhutan and Nepal are very cold as they are up in the high Himalayan mountains — Mt. Everest can be seen from a distance when flying to Paro or Kathmandu. There are also no direct flights from Manila so the cost of travel is high, and there is a visa fee to pay. All of my past trips to attend ALF and/or EFN conferences were sponsored by EFN Asia and the Friedrich Naumann Foundation for Freedom (FNF), except for the Nepal trip in 2015 where I was sponsored by Media 9 and Business 360 magazine, where I was a contributor for free market topics. I will attend the ALF 2019 in another South Asian country, Sri Lanka, from Feb. 28 to March 1. One thing that is weird going there is that almost all airlines from East Asia — Malaysia, Singapore, Thailand, Hong Kong, South Korea, etc. — arrive in Colombo airport in the late evening to early morning. Only the Sri Lankan airline flying from these countries arrives in Colombo at day time. For me this is indirect local airline protectionism. 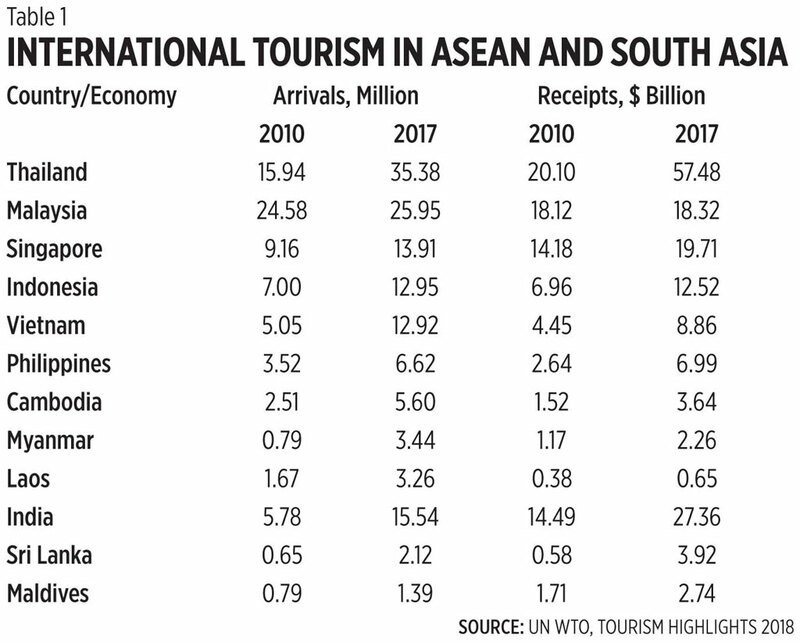 I checked the tourism numbers — South Asia is not exactly a favorite destination for many international visitors, unlike many ASEAN countries. 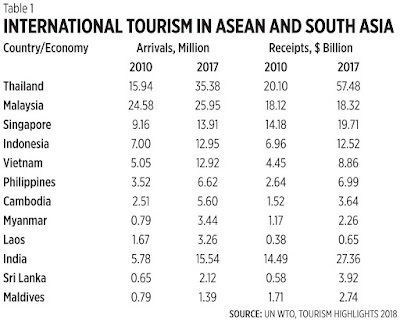 India, with its population of 1.3 billion, attracted only 15.5 million foreign visitors in 2017, nearly comparable with Singapore’s (population 5.7 million) 13.9 million visitors (See Table 1). 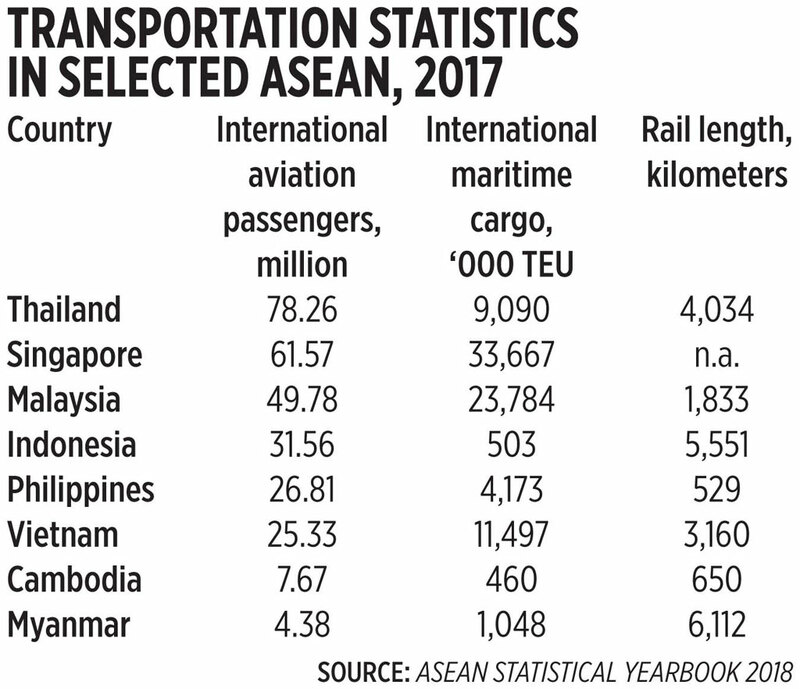 I did not include in the list countries with very small numbers of foreign visitors in 2017 like Brunei (0.26 M), Bhutan (also 0.26 M) and Nepal (0.94 M). Next, I wanted to know how many of those international visitors in the Philippines and its neighbors are from the ASEAN. 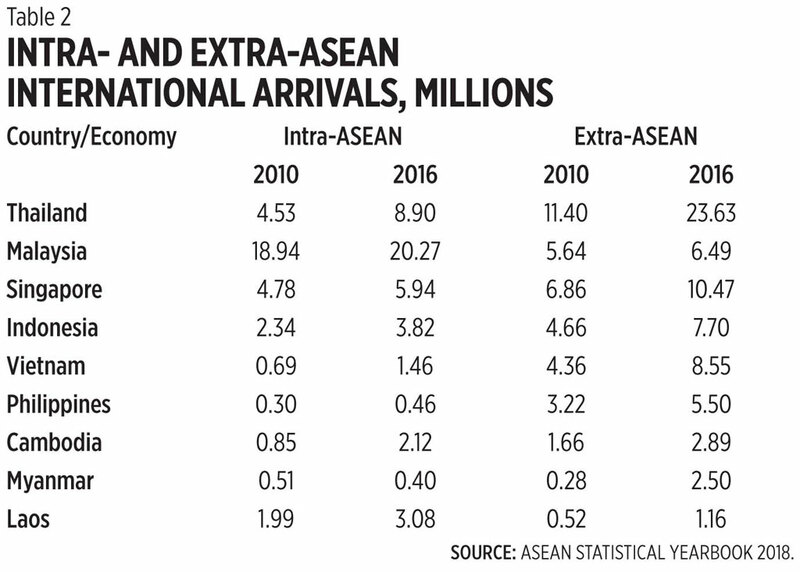 The numbers are a bit surprising — less than half a million of the Philippine’s international visitors are from our neighbors in the ASEAN. We are not attractive to our neighbors, like Myanmar (See Table 2). 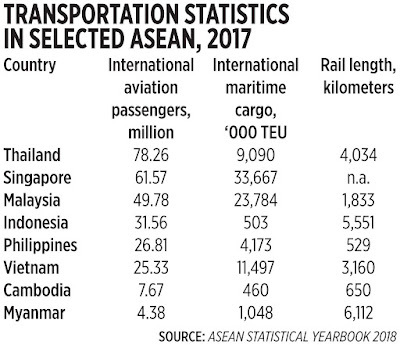 Malaysia, Laos, and Cambodia are attractive to their neighbors — partly because one can travel from Singapore to Kuala Lumpur by car or bus in five hours or less, with no need to fly; and partly because Malaysia has huge competing airlines that cater to all visitors, from the rich to poor travellers seeking budget airlines and landing in budget airport terminals. Thus, the Malaysia experience can be a model for the Philippines in attracting more foreign travelers. Indonesia too — it is expanding its airports to be bigger, more modern. I saw the new Soekarno Hatta Airport last year when I attended ALF 2018 in Jakarta and I was surprised by its modernity. The airport’s passenger traffic rose from 57.8 million in 2012 to 65.7 million in 2018. More big domestic airlines, more regional airline competition, more budget terminals alongside main terminals to attract more budget airlines local and foreign — we need them. The freedom to fly for more Filipinos and more foreigners seeing the Philippines should increase. 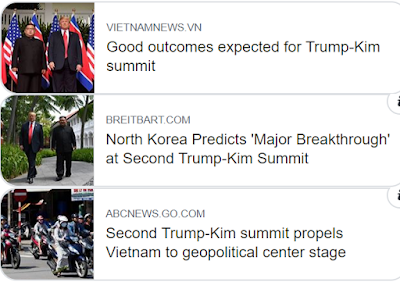 Vietnam as venue of the second Trump-Kim summit next week is perfect, good model for N.Korea transition: (1) VN is politically socialist but economically capitalist, (2) VN has no nukes yet politically secure, (3) VN was a former US enemy and later embraced the US as economic and military partner, (4) VN is an ASEAN member, the association is 3rd biggest consumer bloc in the world (about 650 M consumers) with many friends all over the world. 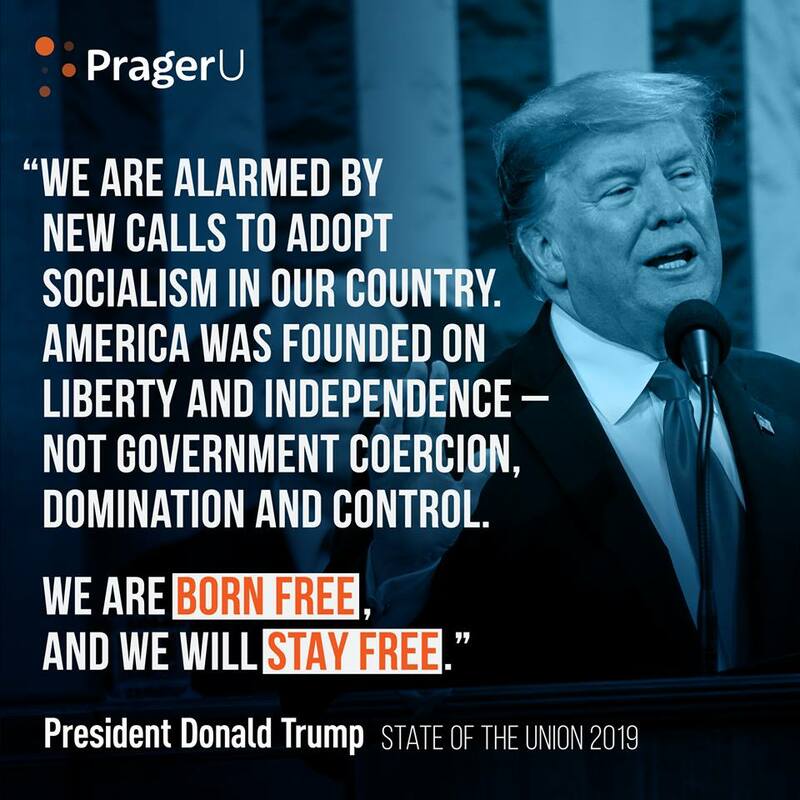 Go Mr. Kim, you may remain politically socialist but embrace capitalism and globalization, embrace America and its huge entrepreneurial talent and resources. No more nukes, more billions of $ of commerce instead. "The United States and Vietnam normalized ties in 1995, decades after the end of the Vietnam War. Over the ensuing quarter century, their economic and trade relations have grown stronger. From 1995 to 2016, bilateral trade grew from $451 million to nearly $52 billion, according to the State Department. 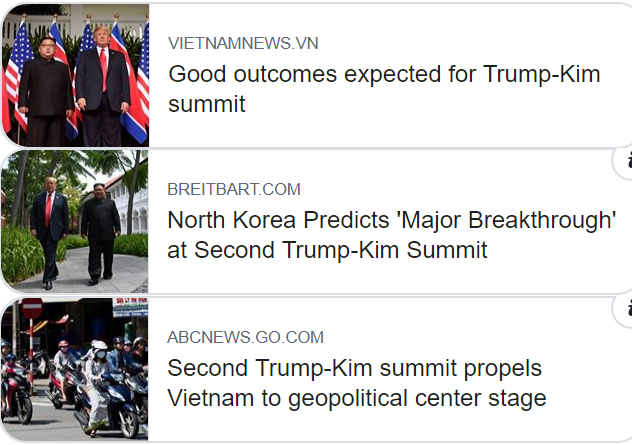 President Barack Obama visited Vietnam in 2016 and Trump attended an international summit there in 2017. Vietnam’s Prime Minister Nguyen Xuan Phuc visited the White House in 2017, too." "Both Trump and Kim, whose regime has been locked in hostilities with the U.S. for almost 70 years, have intense security demands. Vietnam has been building military ties with the U.S. to balance a rising China and -- like Singapore, the host of the first Trump-Kim summit in June -- is among four dozen countries with a North Korean embassy. Moreover, Kim, who must rely on Chinese loaner aircraft and aging Russian-built passenger jets, can reach the communist country by flying over friendly territory." N. Korea will learn a lot from VN -- from privatization of many state-owned enterprises to large-scale exports to (and imports from) the rest of the world, to being a member of a regional (ASEAN) free trade, zero tariff area. Note also that the two Trump-Kim summit are held in the ASEAN, SG last June and VN this month. So a NKorea-ASEAN FTA will not be far fetched. This will be a new growth opportunities in East Asia, no doubt. N. Korea has about 26 M people and consumers, and S. Korea (51 M consumers) can then reduce its defense spending and use more public resources for N. Korea industrialization and development. "Nonoy, as I departed Guimaras yesterday, I saw this sign at the ferry terminal, very prominently displayed. One cannot harvest one's own mangoes without government approval, even if they are damaged from a typhoon! 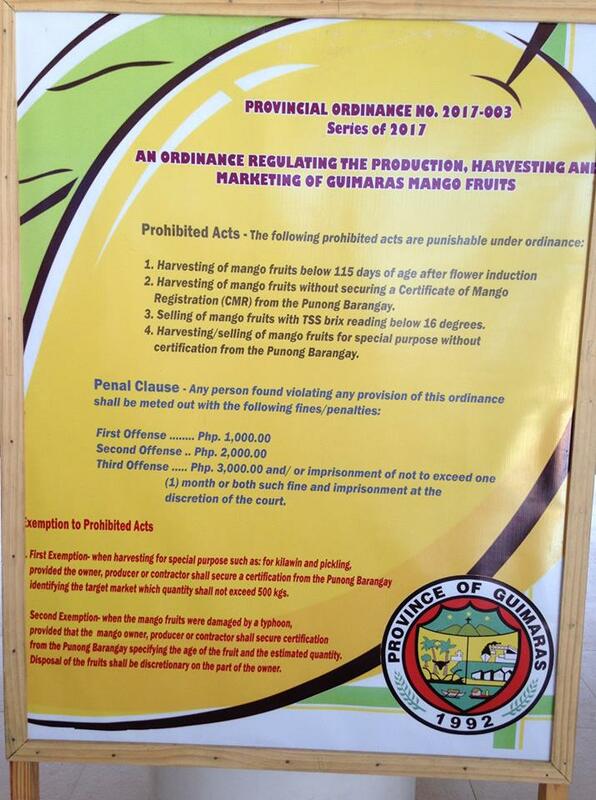 Even with government approval, you are forbidden to harvest your mangoes when you want and in the quantity you want. Do you think that you can see 600kgs of pickled mangos? Too bad, the government forbids you! Were the mangos damaged in some way? Too bad you can only harvest damaged mangos if caused by a typhoon and only with government permission. Do you think that mango taste better if harvested early? Or do you need money and so need to pick early? Too bad. The government forbids you! 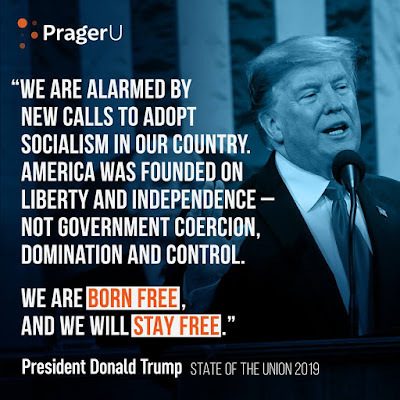 So much for freedom. So much for owning and controlling your own destiny. The government forbids it!" I thanked Bruce for this info. National government bureaucratism has permeated local governments. This is inviting extortion left and right. The barangay officials can now decide who can harvest, who cannot, from their own mango trees. Lousy. Big government pa more. * This is my column in BusinessWorld yesterday, February 12, 2019. The cronyist “Solar para sa Bayan Corporation” (SPBC) franchise bill (HB 8179) was magically passed by the House of Representatives despite opposition by many groups in the energy sector. Among the oppositors is the Developers of Renewable Energy for AdvanceMent, Inc. (DREAM), the umbrella organization of all RE associations in the Philippines. As I did in my letter to Sen. Grace Poe, arguing for the junking of HB 8179, DREAM said the bill is unconstitutional and should not be passed. In particular, (1) it violates the equal protection clause under Article III, Section 1 of the 1987 Constitution. The proposed SPBC franchise has no substantial distinction with other generators that will not be granted a similar franchise. (2) It violates the fundamental right to due process of law under the Constitution. And (3) it violates the proscription against unfair competition. 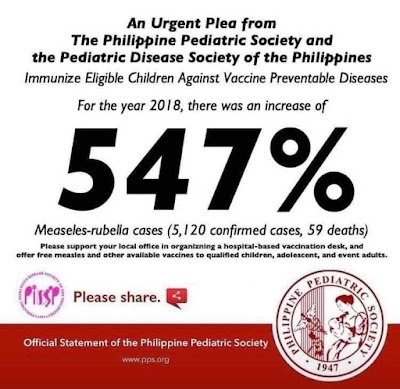 Nonetheless, a Senate Committee Report 659 was passed last week, February 7, 2019, and some outlandish provisions from the original bill have been tamed. Among the changes is that the operational coverage “in any… areas throughout the Philippines” has been limited to only 13 provinces. Note three things here: (1) SPBC claims it is competitive yet it requires a Congressional franchise and a franchise by nature is a monopoly, (2) EPIRA law of 2001 has unbundled energy components and players are classified as transmission, generation, distribution, supply companies; SPBC is a generation, distribution and supply company rolled into one, and (3) first time that a franchise will have implementing rules and regulations (IRR). 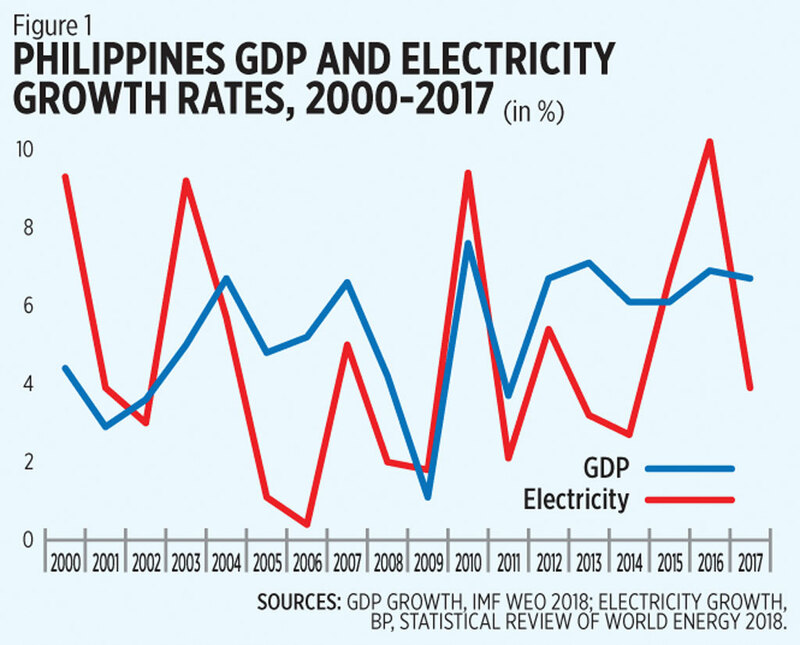 BusinessWorld reported (“Court challenge looms for Solar Para Sa Bayan franchise,” February 08, 2019) that the Coalition for Rural Electrification (CoRE) warned that such a franchise bill may not hold up to a court challenge. Good. It is shameless that this bill was rushed at the House and the Senate where a member is the mother of the company owner as we all know. If it becomes law, the measure should be called as Solar para sa Pulitika Corp. Meanwhile, on another front, there is a last-minute lobby by various protectionist groups who insist that expensive rice is good for the country and the poor. They oppose SB 1998 or the Rice Tariffication bill, removing quantitative restrictions (QR) and replacing it with a 35% tariff rate on imported rice from ASEAN, and 40% or higher on imported rice outside of ASEAN. The protectionists’ main argument is that rice liberalization will lead to the demise of the local rice industry as there will be a huge influx of imported rice from our neighbors. This is outright disinformation, deception and lie. Even if we wanted to import one-half or even one-fourth of our domestic rice consumption, it is not possible, it is not going to happen. 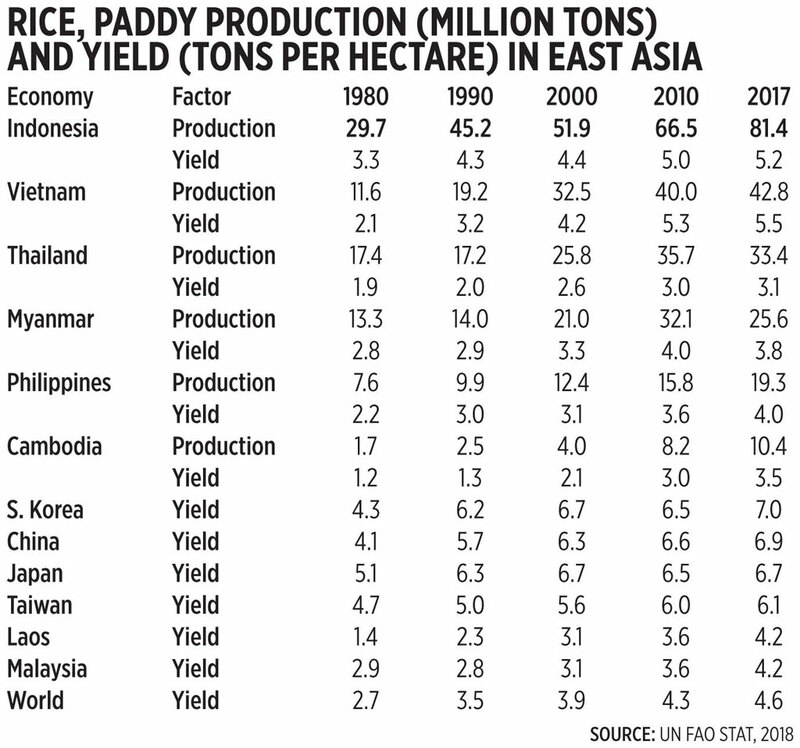 Data from the UN Food and Agriculture Organization (FAO) show that Philippine rice production has been steadily rising and the average productivity per hectare has also been rising, from only 2.2 tons per hectare in 1980 to 4.0 in 2017. The two big rice exporters in the world, Thailand and Vietnam, have actually experienced a declining or low expansion in rice output. Thailand’s output declined from 35.7 M tons in 2010 to 33.4 M tons in 2017. Over the same period, Vietnam’s output increased a little from 40 to 42.8 M tons. 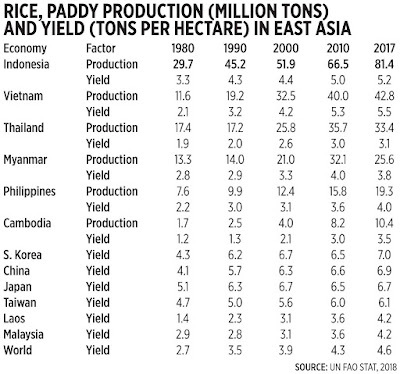 Myanmar and Cambodia can be the next group of rice exporters but they also have a rising demand and population (see table). So the Philippines’ rice importation will be limited and restricted even if it wants to import more and there will be no such demise in the local rice industry. Rice trade liberalization should proceed, and NFA’s distortionist monopoly of power to regulate rice imports should be removed. The 35% tariff is actually high. Why should a P30/kilo potential landed price of rice from ASEAN neighbors be made P40.50/kilo to many poor Philippine households? That 35% should go down through time, down to zero for rice imports from ASEAN. 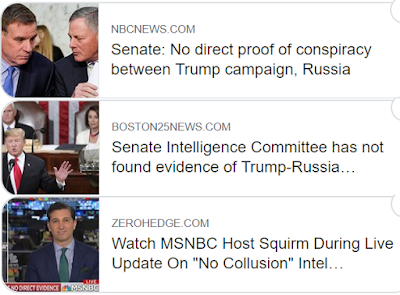 Trump-Russia collusion debunked, next Trump-Timbuktu collusion? Gullibles (and liars) of the world, unite! You have nothing to lose but your emotionalism :-) Even the Democrats in the Senate Committee concur with the findings. Now we expect another drama and lies? Like Trump-N. Korea collusion, Trump-Venezuela collusion, Trump-Timbuktu collusion? The Senate Intelligence Committee is approaching an end to its two year investigation into meddling in the 2016 election, and Democrats and Republicans on the committee both say they have found no direct evidence to connect the Trump campaign in a conspiracy with Russia. 2. Stocks Surge As Senate Intel Committee Confirms "No Collusion"
To the advocates of #Taxtobaccotothemax -- why not advocate ban tobacco, prohibit tobacco? Like current policies of ban/prohibit prostitution, ban/prohibit illegal drugs, ban/prohibit illegal gambling, ban/prohibit smuggling, ban/prohibit corruption and plunder. You cannot advocate ban tobacco because you want lots of tax money from tobacco? So which is which -- more smoking and more tobacco taxes? Or less/no smoking, less/no tobacco taxes? There should be no conflict in the advocacy. UHC shd not get any money from tobacco taxes so that when there is zero smoking, zero tobacco taxes, UHC will still proceed via tax money from other sources. Thank you. Doc Tony said that they want total ban for tobacco but there is need to convince the Northern Luzon bloc to stop producing tobacco. I asked, why not say and advocate that? We have laws on ban prostitution, ban illegal drugs, ban illegal gambling, why not call for a law to ban tobacco? They cannot advocate ban tobacco precisely because they want more tobacco taxes, billions of pesos yearly. There is double talk in the advocacy. So at P35/pack tax, the degree of smuggling in 2018 alone was at least P20 B, and that's for the confiscated products alone, excluded are non-confiscated smuggled and fake cigarettes that were successfully sold. If those P20 B smuggled cigarettes were sold at P70/pack, then that means that some P10 B of potential tobacco taxes (half the price at P35/pack tax) for UHC became zero. Smugglers and criminals became richer, UHC became poorer. And that's for the confiscated tobacco alone, the unconfiscated should be several billions more. I think the "optimal tax" rate for tobacco is not P60/pack, not P90, not P500. Somewhere in the 35-40/pack until the smuggling loopholes are closed. If the loopholes remain huge, then huge smuggling will continue. If legal tobacco becomes P20/stick because of 90/pack tax, then illegal/smuggled tobacco can be sold at P4/stick or less. Cheap tobacco means more smoking will happen, not less. 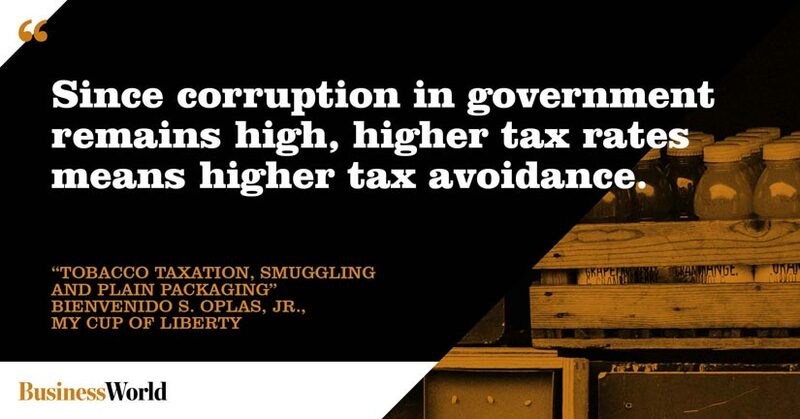 At P30/pack tax under RA 10351 (sin tax law of 2012), smuggling was high. At P35/pack under RA 10963 (TRAIN law of 2017), smuggling became higher. Now they push P60/pack, P90/pack. So since higher tobacco taxes lead to more smuggling, then the unintended #1 ally of smugglers, criminals, terrorists who produce and sell smuggled tobacco, plus their friends and protectors in govt and police are -- ironically, the advocates of #Taxtobaccotothemax? The DOF officials who say that P73/pack is optimal (revenues are maximized while leakage and smuggling are minimized) are exactly the same DOF officials who said that PH inflation in 2018 would be only 2-4% (actual is 5.2%) and GDP growth 2018 would be 7-8% (actual is only 6.2%). Baka gumagamit sila ng bolang kristal in their projections and analysis. "tobacco companies themselves are complicit in illicit trade." Boom, so why don't they launch that #bantobacco campaign? Get them all, legal and illegal tobacco. But anti-tobacco groups also enjoy somehow from the huge tobacco taxes by the billions? Indirectly like huge consulting contracts with PhilHealth, DOH, WHO? (1) "high prices will only deter the YOUTH from smoking"
(2) "no direct relation between taxes and smuggling"
On #1, the non-rich youth would smoke illegal/smuggled tobacco because these are cheap. So when will the anti-tobacco groups ever launch that #bantobacco campaign, 100 years from now while at the moment, big enjoyment from more tobacco tax money? Smuggling proliferation is not exactly due to government incompetence but more of deliberate protection and tolerance of smuggling by certain govt agencies and officials in exchange for huge bribes. 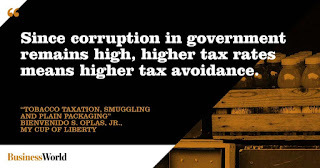 The bigger the tax, the bigger the corruption, the bigger the funds of criminal gangs, terrorist groups that produce, sell and protect the large scale smuggled tobacco, drugs and related products. 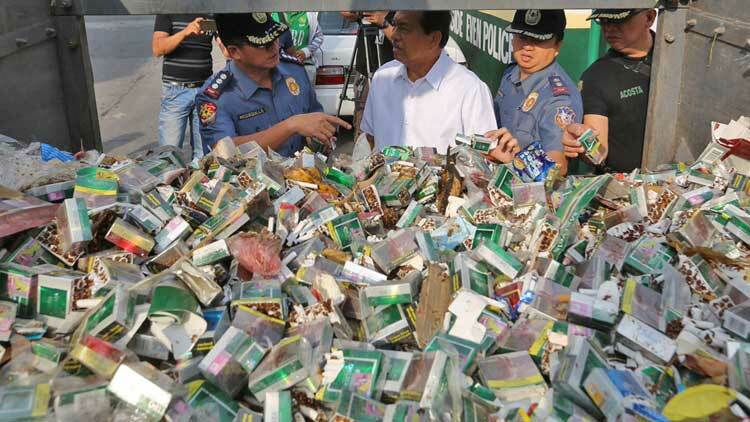 An example perhaps was that P2 B+ tobacco smuggling in Brgy Portic, Bugallon, Pangasinan raided only last November. The 3-term Pangasinan Governor, his son Mayor of Bugallon, they live (or used to live) in that barangay. 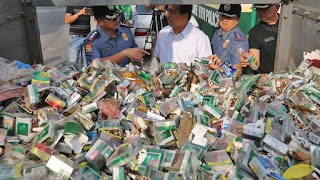 All these years they didn't know there is a multi-billion smuggled tobacco factory in the barangay? Again, campaigners should go for #bantobacco so that both legal and illegal tobacco will be confiscated. #Taxtobaccotothemax only taxes legal tobacco, illegal tobacco is happily and plentifully peddled and sold, and smokers happily smoke cheap tobacco. So long as the #bantobacco is not advanced because activists are begging for "more tobacco taxes please", they become indirect advocates for more smoking of legal tobacco, illegal tobacco does not pay taxes. If people have doubts that Ocasio-Cortez and the new group of 'democratic socialists' (an oxymoron) in the US are not gunning for large-scale dictatorship, see their advocacies. 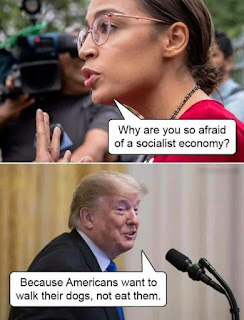 The Trump derangement syndrome (TDS) is really dangerous, it can make otherwise rational people to become irrational. Some of the many news stories when GND was publicly unveiled. Precisely the goal of ecological socialists -- more, bigger, government; more, higher taxes and regulations. 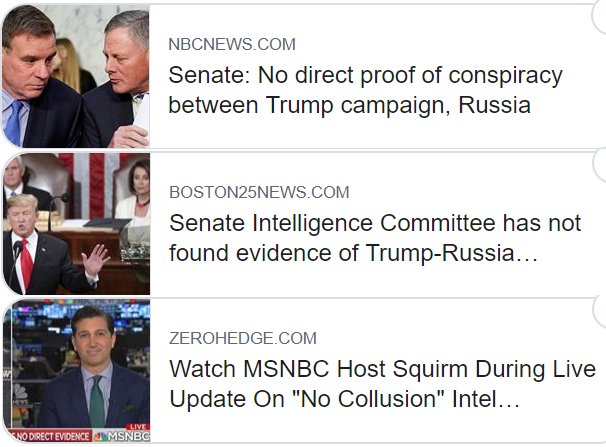 Mueller and TDS people have not produced any proof of the Russia-Russia drama in the 2016 US elections, only lies and deception. So going socialistic is another route for them to attack Trump and his policies. The Dems have more similarity with Russia and China in policies -- lots of central planning, state-engineered economy. Lousy. * This is my column today in BusinessWorld. 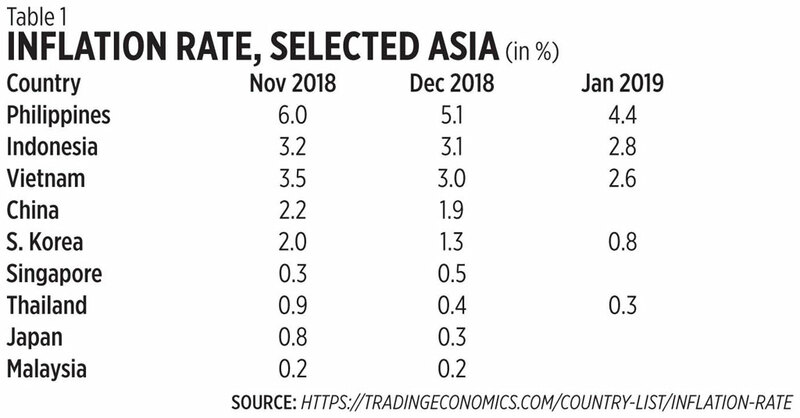 The Philippines registered a 4.4% inflation rate for January 2019. The good news is that it is a lot lower than the past four months’ average of 6.1%, but the bad news is that compared to our neighbors with January 2019 data, it is the highest. In the ASEAN-6, three have near-zero inflation while Indonesia and Vietnam have below 3% (see Table 1). 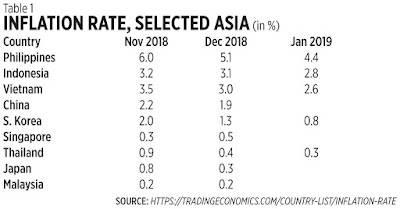 Since Dutertenomics has penalized domestic consumers with ever-rising inflation (1.3% in 2016, 2.9% in 2017, 5.2% in 2018), they should give us a respite, have an inflation target of 1-2% in 2019 via significant tax cuts somewhere, or suspension of any tax hikes. The consumer price index (CPI) which is the basis for computing the inflation rate is composed of 11 items or sectors. Five items with biggest increase in 2018 are enumerated below, plus: Furnishings and household equipment and house maintenance, Clothing and footwear, Communications, Recreation and culture, Education, Restaurant and miscellaneous goods and services. TRAIN law tax hikes in tobacco, oil, LPG have pushed high prices for those products including transportation. Notice that when world oil prices were very low in 2015-2016, the transport sector experienced deflation of -5.4% and -1.4% respectively, followed by electricity, gas and other fuels (see Table 2). Aside from oil tax hikes, there are other factors that are largely politics and government-created, that distort prices upwards. I limit the discussion to those pending congressional action. 1. House Bill (HB) 8885 or the “Student Fare Discount Act” has been passed on 3rd reading last Monday, Feb. 4, 2019. It provides that all Filipino students from elementary to tertiary, technical, and vocational be entitled to a 20% mandatory discount for buses, jeepneys, trains, tricycles, airplanes, and boats. To compensate for big reduction in revenues, public transportation operators will enjoy reduction or exemption from regulatory fees and charges, and can also claim the granted discount as tax deduction. 2. Eight HBs for Committee Report, regulating the transport network companies/transport network vehicle services (TNCs/TNVS), with fees and penalties for violations. A TWG meeting was held at the House on Jan. 22. 3. HB 7436, abolishing the Road Board and management of the Motor Vehicle Users Charge (MVUC), amending RA 8784, was scheduled for a bicameral meeting last Jan. 21. The road users’ tax will go to the National Treasury to be used mainly for road maintenance. 4. Five HBs for Committee Report, allowing and regulating the use of motorcycles as PUVs, amending RA 4136 (Land Transportation and Traffic Code). Meeting held last Jan. 23. Item #1 is wrong, it is government price control and will lead to higher fares for non-students to compensate for the big discounts. DoF will likely oppose 100% the “discount as tax deduction” scheme. DoF just wants tax-tax-tax and dislikes tax deductions. Item #2 is important but the provisions will likely result in more restrictions like franchise cap, instead of more liberalization of the modern and technology-based (not bureaucracy-based) ride-sharing scheme. Congress and LTFRB should avoid more restrictions, leading to lower supply of cars and drivers, which will lead to longer waiting periods, passenger inconvenience, and higher fares. Liberalization like higher or no franchise cap will lead to a better outcome: more cars and drivers, shorter waiting period, passenger convenience and lower, competitive fares. Item #4 is good, it will expand the choices for commuters but LTFRB accreditation should be via a corporate setup like the TNCs, not individual units and operators like jeepneys. When motorcycle drivers abuse their passengers, their company should be held accountable, which will put drastic disciplinary measures against erring partner-drivers. The Philippine transport sector should be unburdened with more oil taxation, more bureaucratic regulations and more price controls or mandatory discounts. The purported goal of lower fares, lower inflation for the public, is almost always defeated as the actual results are higher fares, higher inflation for the public. For many years now, we have been bombarded by the DOH, WHO, many health NGOs and physician groups to be scared of, and pour lots of public and private money on non-communicable diseases (NCDs). Now the real communicable and infectious diseases are with us. The vaccine vs communicable disease dengue has been overly-politicized vs the previous administration. 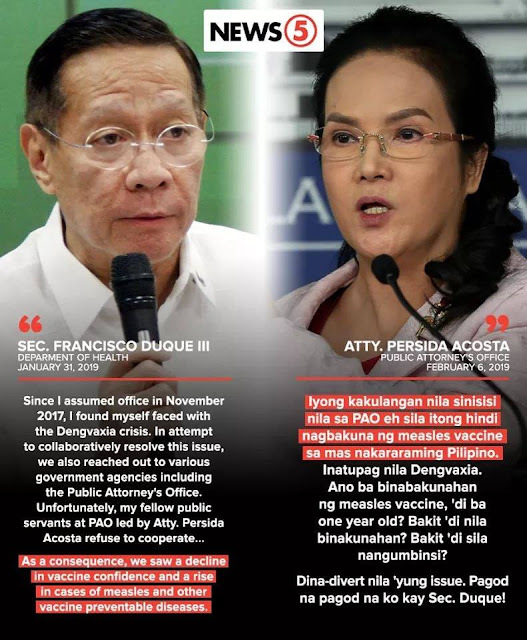 Among the reasons for the outbreak is the political drama by the head of the Public Attorney's Office (PAO), Persida Acosta. My problem with pouring huge public money on NCDs is that these are bottomless spending diseases. Even if we have P1 trillion/year for NCDs (1/3 of total budget) they won't be enough. Treating an advance stage cancer case might require 7 digits per patient. So even a P200/pack tobacco tax, or P200/liter beer tax will not be enough. A better situation is that public money be focused on controlling communicable diseases like measles, dengue and malaria. Limited and capped amount of public resources be used for NCDs. People should get private health insurance to complement govt health insurance, plus charity, to deal with NCDs. * This is my article in BusinessWorld last February 01, 2019. It is a web version only and not published in the print edition due to space constraints that day.